Thursday 29th December 2016 – 1.15pm – Jamie Arrowsmith. A van driver is in a critical condition following a collision with a car this morning. West Midlands Ambulance Service was called to the junction of Cannock Road and Stafford Street in Wolverhampton shortly after 8.20am and sent two ambulances, a paramedic area support officer and a MERIT trauma doctor to the scene. A West Midlands Ambulance Service spokesman said: “Crews arrived to find a car and a van that had suffered significant damage in the collision. “The driver of the van, a man, was out of the vehicle on the arrival of ambulance staff. “He had suffered multiple serious injuries in the collision and was in cardiac arrest. “Crews administered advanced life support at the scene and successfully managed to restart the man’s heart. He was immediately transported to Queen Elizabeth Hospital, Birmingham, with the doctor travelling on the ambulance to continue treatment en-route. “Unfortunately, his condition is described as extremely serious. Wednesday 28th December 2016 – 4.15pm – Claire Brown. A teenage boy has ended up in hospital this afternoon after a road traffic collision in Birmingham. West Midlands Ambulance Service was called to Clapgate Lane, Bartley Green, at around 2.30pm (Wednesday). An ambulance, a paramedic area support officer and the Midlands Air Ambulance from Cosford with a MERIT trauma doctor on board attended the scene. The Mental Health Triage Car with a paramedic, police officer and mental health nurse on board were also sent to the incident due to their close proximity. Wednesday 28th December 2016 – 12.00noon – Claire Brown. It is with deepest sadness that West Midlands Ambulance Service has learnt of the sad passing of Community First Responder Jon Whitehouse. Jon was a volunteer CFR with FastAid Black Country and responded to 999 calls in his local area on behalf of West Midlands Ambulance Service. He sadly died in a road traffic collision on the A454 Bridgnorth Road in Shipley on Boxing Day (26th December). In March, Jon received a Chief Officers Commendation at the Trust’s awards ceremony for his excellent CFR work and was an extremely enthusiastic member of the team who will be sadly missed. Our thoughts go to his family and friends at this sad time. Thursday 22nd December 2016 – 9.50am – Murray MacGregor. 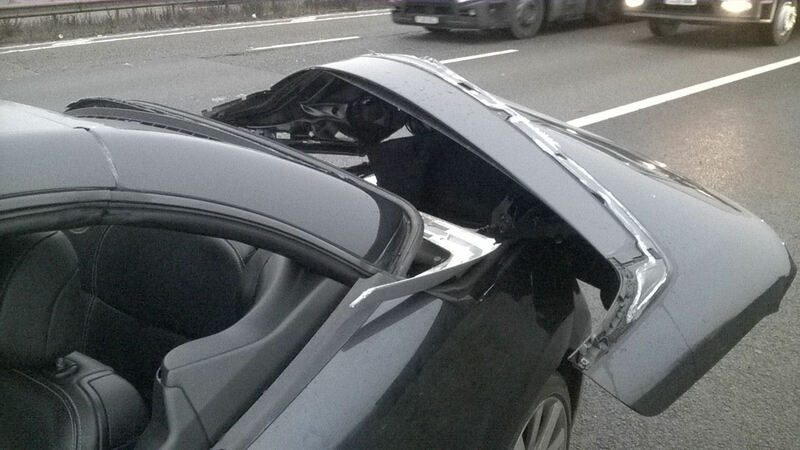 A crash that has led to the closure of one of the busiest sections of the M6 motorway thankfully resulted in no injuries. The crash between a lorry and a car happened shortly after 6.30am this morning between junctiion s 7 and 8 on the northbound carriageway. A single ambulance attended the scene. A West Midlands Ambulance Service spokesman said: “The crash left the car at right angles to the carriageway against the lorry. “There was a 27 year old woman and her three year old son in the car. Both were given a thorough assessment; whilst they were shaken, they had not been injured and were discharged after being given advice. “The motorway remains closed due to a diesel spillage. You are advised to follow updates from Highways England on twitter @HighwaysWMIDS and Central Motorway Police Group @cmpg for details of the closure. Thursday 22nd December 2016 – 9.00am – Murray MacGregor. One man has suffered critical injuries after a multi vehicle accident on the M6 motorway. Three ambulances, a paramedic area support officer and the MERIT Trauma doctor were sent to the scene. A West Midlands Ambulance Service spokesman said: “When crews arrived they found a multi-vehicle crash involving a number of cars and lorries. There was debris across both carriageways. “Crews found one man in the southbound carriageway. He had suffered multiple serious injuries and was semi-conscious. The ambulance staff treated him at the scene before taking him on blue lights to the major trauma centre at University Hospital Coventry & Warwickshire. Wednesday 21st December 2016 – 11.50am – Claire Brown. A man is in a critical condition after a collision with a train in Birmingham this morning. West Midlands Ambulance Service was called by the British Transport Police to the railway line near to Shaftmoor Lane, Acocks Green, at 9.45am (Wednesday). Two ambulances, a responder paramedic, the West Midlands Central Accident Resuscitation Emergency (CARE) Team, the Warwickshire and Northamptonshire Air Ambulance and the Trust’s Hazardous Area Response Team (HART) paramedics attended. A West Midlands Ambulance Service spokeswoman said: “Ambulance staff arrived to find an unconscious man trapped underneath a train. The team worked quickly with colleagues from the police, fire and railways to release the man so that vital treatment could commence. Friday 16th December 2016 – 11.30pm – Jamie Arrowsmith. One man has been treated by ambulance staff and taken to hospital following the disturbance at Winson Green Prison today. West Midlands Ambulance Service attended the prison after receiving a call at 12.23pm and have worked closely alongside emergency service partners throughout the day. A West Midlands Ambulance Service spokesman said: “Once it was deemed safe for ambulance staff to do so, they entered the prison and found one patient, a man believed to be in his 20s. “He was treated for an injury to his face, cuts and bruises as well as a slightly reduced level of consciousness. Friday 16th December 2016 – 2.30pm – Jamie Arrowsmith. 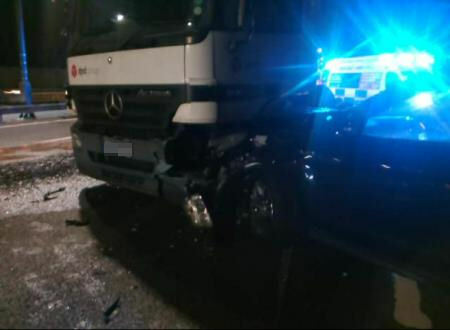 A lorry driver had to be cut out of his cab following a collision with a second lorry this morning. West Midlands Ambulance Service was called to Weston Road in Stafford at 6.55am and sent an ambulance, a paramedic area support officer, a BASICS doctor and a MERIT trauma doctor to the scene. “A West Midlands Ambulance Service spokesman said: “On arrival at the scene, crews discovered a man, believed to be in his 40s, who was trapped inside his cab as a result of the collision. “Ambulance staff worked closely with the fire service to cut the man free before treating him for serious arm and leg injuries as well as a suspected chest injury. “He was immobilised and given pain relief before transported to Royal Stoke University Hospital for further assessment. The MERIT doctor travelled with the patient to continue treatment en-route to the hospital. Friday 16th December 2016 – 10.45am – Jamie Arrowsmith. An ambulance crew has praised the quick thinking actions of commuters and staff at a railway station this morning for rescuing a woman from the tracks. The woman, believed to be in her 20s, had suffered a medical episode at Wylde Green Railway Station in Sutton Coldfield and fallen on to the tracks as a result. Whilst some fellow passengers acted quickly to get her off the tracks, others alerted staff at the station in order to stop any trains. West Midlands Ambulance Service was called to the incident at 7.50am and sent one ambulance to the scene. A West Midlands Ambulance Service spokesman said: “Great credit goes to those who acted so quickly to rescue the woman and bring her back to a place of safety. “Well done also to those who had the presence of mind to alert staff straight away in order to stop any trains that may have been approaching. Friday 16th December 2016 – 9am – Jamie Arrowsmith. Two men have been treated for serious injuries and taken to one of the region’s major trauma centres following a single vehicle road traffic collision in the early hours of this morning. West Midlands Ambulance Service was called to the junction of the A46 and Crew Lane in Kenilworth at 4.05am and sent two ambulances, a paramedic area support officer and a MERIT trauma doctor to the scene. A West Midlands Ambulance Service spokesman said: “Crews arrived at the scene to find a car that had suffered damage all over and two patients, one of whom was lying in the road. Thursday 15th December 2016 – 5.18pm – Murray MacGregor. 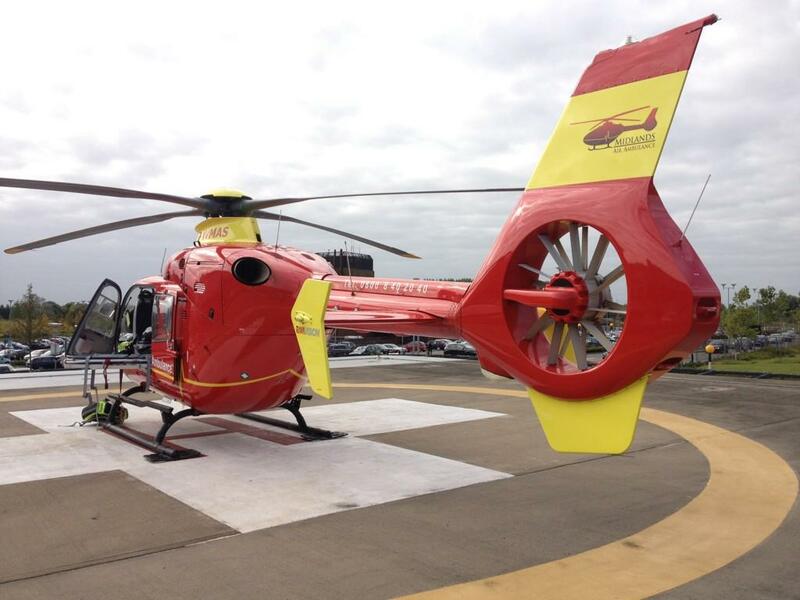 A young motorcyclist has been airlifted with a badly broken leg after a collision with a car. The incident happened at about 1.20pm, close to the bridge over the River Avon on the A46 in Evesham. An ambulance, a paramedic officer and the Midlands Air Ambulance from Strensham attended the scene. A West Midlands Ambulance Service spokesman said: “When crews arrived they found a car that had damage to the front offside quarter; the motorbike was on the opposite side of the road against the kerb. “The rider, a 20 year old man had suffered a broken left leg. He was immobilised, had his leg splinted and had a pelvic binder attached as a precaution before he was airlifted to the Major Trauma Centre at University Hospital Coventry & Warwickshire. Excited by the news that we are reopening our student paramedic applications? Then you will be interested to hear what Recruitment Manager Louise Harris has to say in order to help try and make your application a successful one. Thursday 15th December 2016 – 3pm – Jamie Arrowsmith. Nobody likes being rejected, especially at Christmas. But that is what happened to hundreds of applicants to our recent student paramedic recruitment programme, for one simple reason. The message cannot be clearer – if you haven’t already got your C1 driving licence, or at least applied for it, your application to become a student paramedic will not be looked at, let alone considered. As an early Christmas present for all those who missed the recent deadline to get your student paramedic application in, or submitted it without having the relevant driving criteria or qualifications, applications are reopening on Monday (December 19th) and you have until Sunday, January 8th to ensure you have all you need in place for your application to be considered. Hundreds of the original applications were not even looked at, because the C1 licence was missing or had not been applied for. Therefore, if you are planning to spend your Christmas holidays perfecting your application, please ensure you have your C1 application in place, otherwise you will have wasted your time. There are 300 student paramedic places on offer with positions available in the Black Country, Birmingham, Shropshire, Staffordshire and Coventry & Warwickshire. As well as the C1 licence, you will have to provide original certificates showing that you hold a minimum of five GCSEs (including English, Maths and Science) plus an A-Level qualification or equivalent. Recruitment Manager, Louise Harris, said: “This is an exciting opportunity for those who missed the deadline or were not shortlisted last time. “If the C1 isn’t in place, the application form is not looked at, so please make sure this is done. It is the biggest reason why applications are rejected. “Applicants also need to make sure they hold the required qualifications and have the certificates, as you will be asked to produce them. “I would urge anyone looking to apply to make sure that they read all of the information on NHS Jobs thoroughly, particularly the ‘Additional Information’ document that you can download. If you need support or require further information about filling in your application form, please contact recruitment@wmas.nhs.uk. Thursday 15th December 2016 – 12.32pm – Murray MacGregor. A woman has died despite intensive care provided by ambulance staff after a two car collision. The crash happened near the junction of Stubbers Green Road and Wharf Approach in Aldridge at just after 7.00am. Three ambulances, a paramedic area support officer and the doctor and critical care paramedic from the Midlands Air Ambulance from Cosford, who responded in a rapid response vehicle, were sent to the scene. A West Midlands Ambulance Service spokesman said: “It was immediately clear that one of the two casualties, a woman, was in a very serious condition. “The crew got her onto the ambulance and immediately started moving towards Walsall Manor Hospital using blue lights and sirens. They rendezvoused with the doctor from Cosford on Mellish Road and he performed advanced interventions. Sadly, despite all efforts, it wasn’t possible to save her. Wednesday 14th December 2016 – 5.15pm – Claire Brown. It’s something ambulance staff hear most weekends from the ‘friends’ of drunk patients we’re trying to treat. When you’re out this festive period, we’re urging people to look after each other by sticking together and keeping an eye on what your friends are drinking so that the skills of ambulance staff are reserved for saving lives rather than babysitting people who have simply had too much to drink. For the 10th year, the Trust’s Temporary Minor Injuries Unit (TMIU) returns to Birmingham City Centre to provide onsite treatment to partygoers who end up injured, intoxicated and separated from their friends during their night out. The self-contained medical unit, staffed by WMAS, volunteers and medics, treats patients on site to help ensure ambulance crews in the City are free to respond to life-threatening emergencies. The TMIU will once more take up residence in Cambridge Street, in space provided by the Library of Birmingham and will operate on Saturday 17th, Friday 23rd and Saturday 31st December after the library has closed. Paramedic Mike Duggan oversees the running of the Trust’s smaller-scale City Centre Treatment Unit which operates each Friday and Saturday night on Broad Street and treats 60-80 patients each weekend. Wednesday 14th December 2016 – 10.45am – Claire Brown. A man who suffered a cardiac arrest in a car in Kings Heath last night had the best chance of survival thanks to quick thinking and early CPR. West Midlands Ambulance Service was initially called to an RTC at the junction of Alcester Road South and Stot Fold Road in Kings Heath shortly after 9.45pm yesterday (Tuesday). During the 999 call, an ambulance en route to hospital came across the incident and stopped to help. A second ambulance, a paramedic area support officer and a responder paramedic were also sent to the scene. A West Midlands Ambulance Service spokeswoman said: “It appeared to the ambulance crew that the car had stopped rather than it colliding with anything. The driver of the car, a man, was unresponsive to the ambulance crew so they smashed the driver’s window to gain access to the car. “The man was unconscious and during assessment his condition deteriorated and he went into cardiac arrest. Wednesday 14th December 2016 – 8.40am – Claire Brown. A collision involving a car and a van left three men in the back of an ambulance last night. The incident happened on West Bromwich Road, Walsall at 6.20pm yesterday (Tuesday). Three ambulances and a paramedic area support officer attended the scene. A West Midlands Ambulance Service spokeswoman said: “The collision caused substantial damage to both vehicles. The driver of the car, a man in his 30s, sustained injuries to his back, neck, chest, abdomen and arm. Ambulance staff were also concerned he had a head injury. He was given treatment on scene and stabilised before being taken to Queen Elizabeth Hospital Birmingham. “The passenger of the car, a second man in his 30s, suffered a suspected fracture to his arm as well as multiple minor injuries to his finger, neck and chest. He was given pain relief before being taken to Sandwell Hospital. Tuesday 13th December 2016 – 10.39pm – Murray MacGregor. 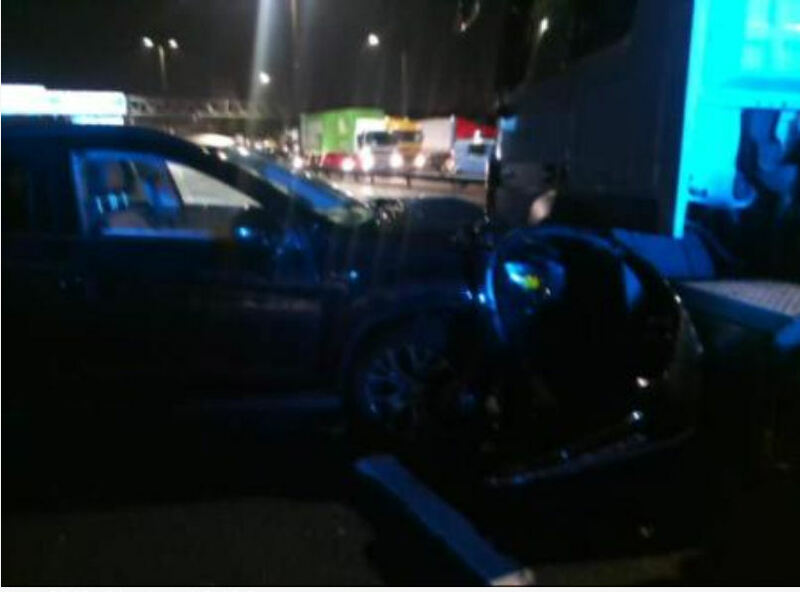 A woman has had a lucky escape after a collision with an HGV saw her car spin into the middle lane of a busy motorway. 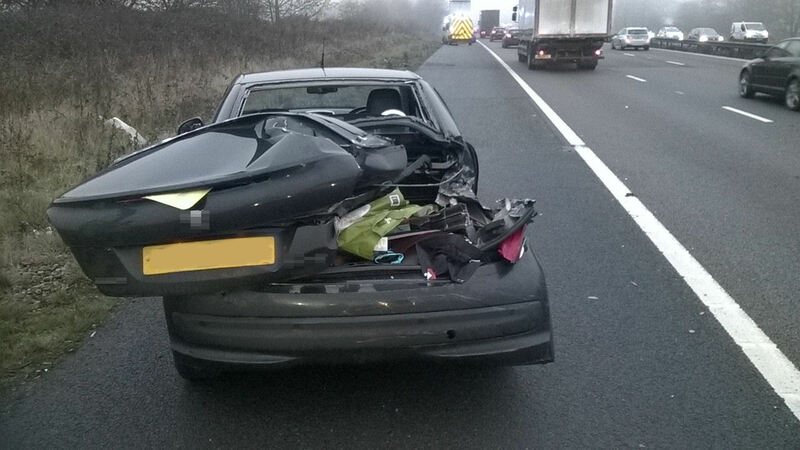 The crash happened on the southbound M6 between junctions 3a and 3 just after eight o’clock this morning. A West Midlands Ambulance Service spokesman said: “The convertible car had damage down the driver’s side and the boot. “After the initial collision, the car spun and ended up in lane 2 of the motorway; thankfully all of the other vehicles using the motorway managed to avoid hitting it. “The driver, a 27 year old woman, was complaining of left shoulder and back pain. 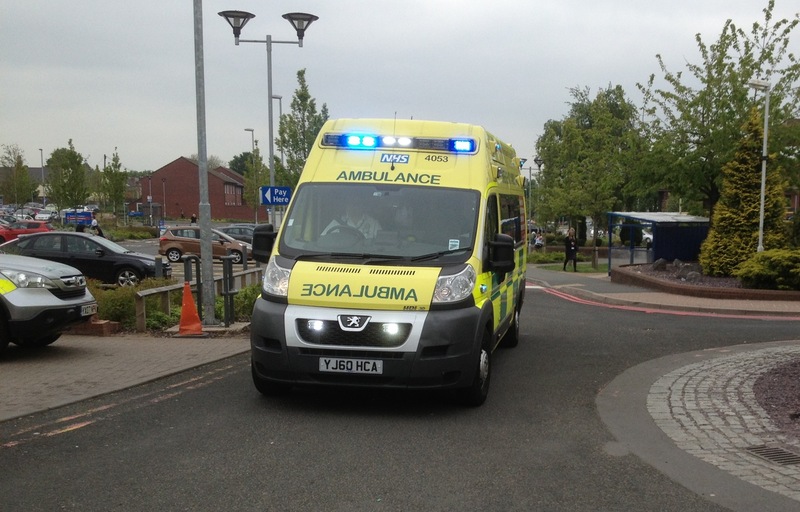 After an assessment and pain relief at the scene, the woman was discharged with advice. “The man driving the lorry was uninjured. Thursday 8th December 2016 – 5.50pm – Claire Brown. An elderly woman is in a critical condition following a road traffic collision in Birmingham this afternoon. West Midlands Ambulance Service received a 999 call to reports of a collision involving a pedestrian and a van on the Tyburn Road near Happy Days Nursery at around 2.15pm (Thursday). Two ambulances, a paramedic area support officer and the Midlands Air Ambulance from Cosford with a MERIT trauma doctor on board attended the scene. A West Midlands Ambulance Service spokeswoman said: “When ambulance crews arrived they found a pedestrian, an elderly woman, being given excellent first aid by members of the public. Wednesday 7th December 2016 – 12.30pm – Murray MacGregor. West Midlands Ambulance Service (WMAS) is rolling out 66 of the most advanced ambulances ever seen. The vehicles, which use technology normally associated with the aerospace industry, come with the key message emblazoned on the rear that there is an alternative to 999. It is part of a joint initiative with NHS England to highlight that patients don’t always need to dial 999 to get urgent care. WMAS Chief Executive, Anthony Marsh, said: “These new ambulances are some of the most sophisticated emergency vehicles in the world. Not only are they packed full of the latest technology to help patients, but they are more comfortable and efficient than ever before, using technology piloted in the aerospace industry. Dr Helen Thomas, National Medical Advisor for Integrated Urgent Care at NHS England, said: “It’s really good to see the NHS 111 non-emergency number sitting alongside 999 on these ambulances. “This gives a clear message that 999 is for life-threatening emergencies – but if you’re in need of urgent help and it’s not an emergency there is another number to call – NHS 111. Tony Page, WMAS Fleet General Manager, added: “By using construction methods used in aircraft manufacture we are providing our patients and staff with a quieter and warmer working area. Improvements include better air suspension and more comfortable seating which will provide a better ride and handling. “The techniques used mean the vehicles are lighter which will improve the handling and reduce fuel and maintenance costs, allowing us to invest even more into front line clinical care. “We have worked closely with our staff and the manufacturers to design the vehicles so that they are easy to use and easier to clean and restock for our Ambulance Fleet Assistant teams. 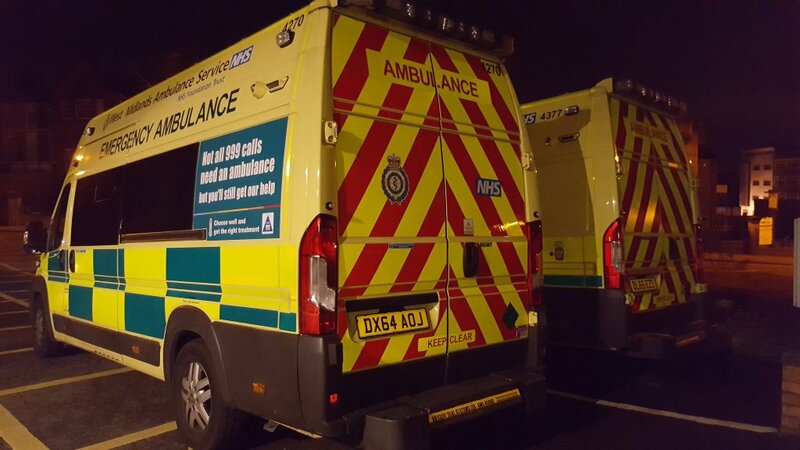 WMAS Communications Director, Murray MacGregor, added: “It is great that we have been able to work with NHS England to get such important messages out to the public by using the side of the ambulances. We first started using this method some years ago and I’m delighted that NHS England see the value of this method of providing information to the public. Wednesday 7th December 2016 – 9.45am – Jamie Arrowsmith. A pedestrian received specialist trauma care at the scene of a collision with a car yesterday before being taken to one of the region’s major trauma centres in a serious condition. West Midlands Ambulance Service was called to Worcester Street in Stourport-on-Severn, shortly before 4.25pm and sent two ambulances, a community paramedic in a rapid response vehicle, a senior paramedic officer, a MERIT trauma doctor and the Midlands Air Ambulance crew from Strensham in a rapid response vehicle to the scene. A West Midlands Ambulance Service spokesman said: “On arrival at the scene crews discovered a man, believed to be in his 50s, with a severely reduced level of consciousness. “He was treated for multiple serious injuries, including to his head, chest and legs. In order to stabilise his condition, he was anaesthetised at the scene. “He was then transported to Queen Elizabeth Hospital, Birmingham with the MERIT doctor travelling on the ambulance to continue treatment en-route. Monday 5th December 2016 – 11.30am – Claire Brown. Three people, including a little girl, were injured after their car ended up on its side in a ditch last night in Birmingham. West Midlands Ambulance Service was called to Egghill Lane in Frankley at 8.45pm (Sunday) after reports of a two-car collision. Three ambulances, a paramedic area support officer and a MERIT trauma doctor attended the scene. A West Midlands Ambulance Service spokeswoman said: “When ambulance staff arrived they found one car in a ditch on its following a collision with a second car. Thankfully, all three occupants of the overturned car managed to get out of the vehicle with some assistance from the fire service and ambulance staff. “The driver of the overturned car, a man in his 40s, sustained a cut to his face and pain in his hip and leg. He was given paracetamol to ease his discomfort before being taken to Queen Elizabeth Hospital Birmingham. “One passenger, a woman, had a cut to her face as well as shoulder and hip pain. She too was administered pain relief before being conveyed to the same hospital as a precaution. “A second passenger, a 6-year-old girl, suffered a chest injury, wrist pain and a bump to her head in the collision. Ambulance staff assessed her at the scene before she was taken by ambulance to Birmingham Children’s Hospital for further checks. Monday 5th December 2016 – 9.45am – Claire Brown. Two women, a man and a young girl ended up in hospital on Saturday evening after being involved in a two-car collision in Warwickshire. West Midlands Ambulance Service received a 999 call reporting a collision on the A439 Warwick Road, Black Hill shortly after 7.15pm on Saturday 3rd December. Three ambulances, a paramedic area support officer and the critical care car from The Air Ambulance Service attended the scene. A West Midlands Ambulance Service spokeswoman said: “Crews arrived to find two cars which had collided. The first car contained four occupants. A woman in her 40s was suffering chest discomfort and a 12-year-old girl was found to have sustained hip pain in the collision. Both were fully assessed by ambulance staff before being taken to University Hospital Coventry and Warwickshire as a precaution. Two other occupants were described as ‘walking wounded’ and did not require hospital treatment. “From the second car, two occupants were more seriously injured. A 46-year-old man, the rear seat passenger, was treated on scene by ambulance staff for a nasty laceration to his head together with leg injuries. He was taken to the same hospital on blue lights for further trauma care. Thursday 1st December 2016 – 5.30pm – Claire Brown. A collision between a car and a heavy goods vehicle on one of the main roads in Wolverhampton has left a woman with a serious head injury this afternoon. West Midlands Ambulance Service received a 999 call reporting a road traffic collision between a car and a HGV on the A449 in Coven, Wolverhampton at 3.15pm (Thursday). Two ambulances and two Midlands Air Ambulances from Tatenhill and Cosford attended; one with a MERIT trauma doctor on board. A West Midlands Ambulance Service spokeswoman said: “The passenger of the car, a woman in her 40s, sustained a nasty laceration to her scalp after hitting her head on the windscreen. Ambulance staff administered pain relief to the woman and dressed her wound before taking the woman to New Cross Hospital for further checks.